Locating animals inside thier cages at a zoo is pretty hard, especially because their cages are so huge. This leopard's cage for instance. I'd almost turned away from it dissapointed on failing to spot the beast when I (by chance) looked up and spotted the spotted cat. Wow Rungta! Wonderful silhouette of the caged cat...looks Brilliant! The sky colour complements this pic perfectly. 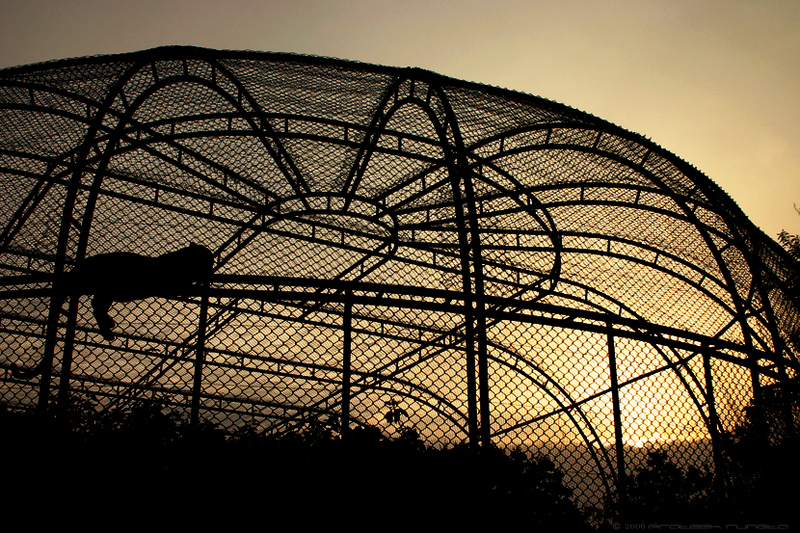 That sure looks like a huge cage... Nice find :) Where did you take this shot btw? Great capture! Wonderful setting and nice angle. Thanks Rashmi and Suji ma'am. I took this one at the Bokaro Zoo. Very difficult to capture as a still. Good work. Wow! Thanks a lot Mamu (SKA), Abhishek, Sanchit, Aditya and Veeru. hmm.. what a snap. why don't you apply for a job at Daily Bugle.